Quito, Nov. 16.─ Ecuadorians have not been gentle to leaders who seek to prolong their hold on power beyond what the constitution allows. Past presidents who tried have been shot or even hacked to death by angry citizens (though not since 1912). Rafael Correa, the leader today, runs no such risk with his attempt to change the constitution to allow him to run again when his term expires in 2017. But he has galvanised the opposition. 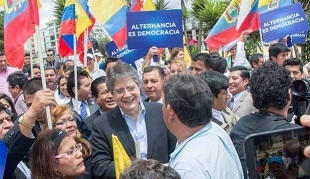 On November 6th a coalition of centrist and conservative parties launched a drive to collect the 584,000 signatures needed to force a referendum on Mr Correa’s plan to eliminate term limits for elected politicians. Although Mr Correa, a left-wing populist, is personally popular, polls show that a large majority of voters want the referendum to go ahead. It may be the opposition’s best chance to unseat him.